This photo dated 14 August 1993 is kindly provided by Jim Watts and shows Pendennis Castle leading a tour train on Hammersley Iron rails. 4079 Pendennis Castle was constructed in 1924 by the Great Western Railway, UK at their Swindon works, as one of the early members of the very successful "Castle" class of express passenger locomotives which eventually numbered 171 examples. 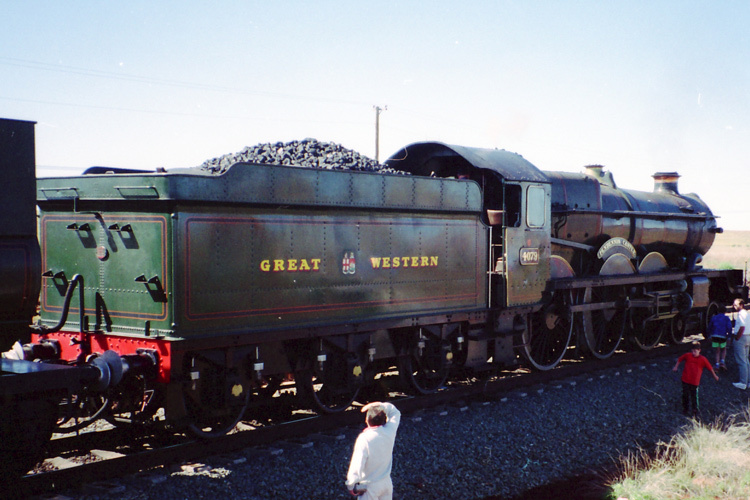 Pendennis Castle was selected by the Great Western Railway for the locomotive exchange trials of 1925, where she outperformed the LNER Gresley pacifics. She was subsequently displayed at the Wembley Exhibition of 1925 and remained a celebrity of the Castle class for the remainder of her working life. 4079 Pendennis Castle was withdrawn by British Railways in 1964 and purchased privately for preservation, ending up at Steamtown, Carnforth. In 1977 she was sold to Hammersley Iron and arrived in Australia via Sydney before being shipped from Newcastle to Dampier, in the the Pilbara region of Western Australia's north. At Dampier, 4079 Pendennis Castle was operated and maintained by the Pilbara Railways Historical Society. The locomotive ran rail tours on the Hammersley Iron railway system, and received a comprehensive overhaul between 1985 at 1987. A notable excursion for Pendennis Castle was a transfer to Perth in 1989 to be reunited with LNER Gresley Pacific '4472 The Flying Scotsman'. By 1995 Pendennis Castle was out of use pending a further overhaul including boiler repairs. Pendennis Castle was subsequently donated by Rio Tinto to the Great Western Society and repatriated in 2000. She is now under overhaul to main line operation at the Great Western Society's excellent museum and workshop at Didcot Railway Centre. The Wikipedia page for Pendennis Castle offers a good history of this famous locomotive and its time in Australia. 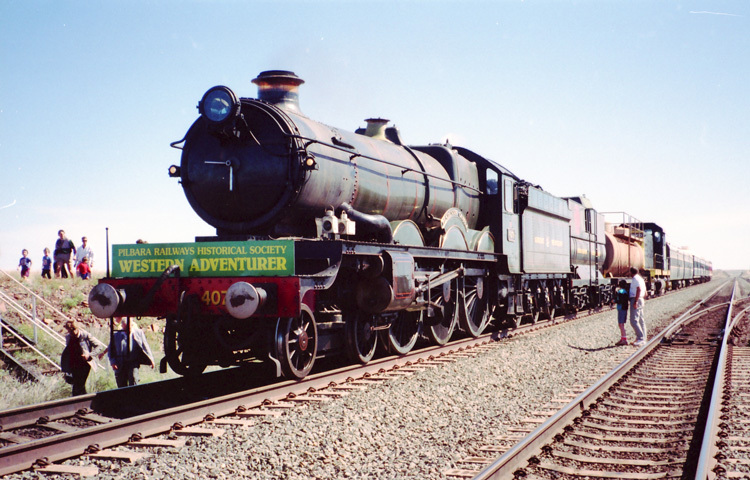 The Exhibits Page of Pilbara Railways Historical Society website also provides a good history of Pendennis Castle and her 23 years in their care. This rear view is also provided by Jim Watts and shows Pendennis Castle on 14 August 1993.